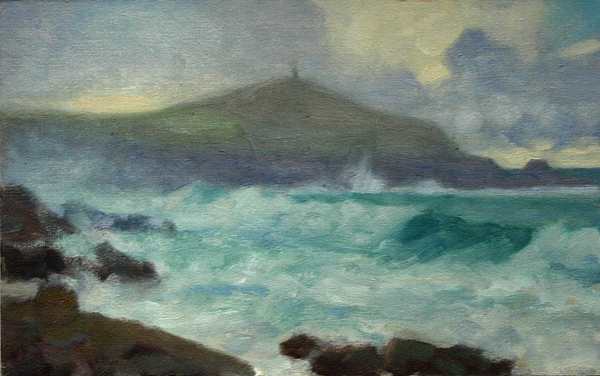 After more than a month of dull, uninteresting weather conditions and very little sunshine, a day of frequent, heavy rain showers and some decent waves provided the impetus to go down to Porth Nanven and try some painting in the rain. Painting in oils in falling rain or snow is always a challenge as not surprisingly, oil paint and water don’t mix. The water contaminates the paint forming a gloopy, very difficult to control emulsion, while droplets of water on the painting surface prevent later layers of paint from adhering to the layers underneath. Still, despite the difficulties it was good to get outside again to paint the ocean.